Your feedback is most welcome. You can use either the Contact form or the following methods. 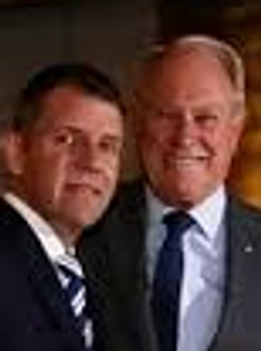 NSW Premier, Mike Baird suddenly left politics for family reasons. Two days earlier Maritime began a preliminary investigation into the government seizure of the two vessels shown above by many years ago. His father Bruce Baird was the Maritime Minister at the time. 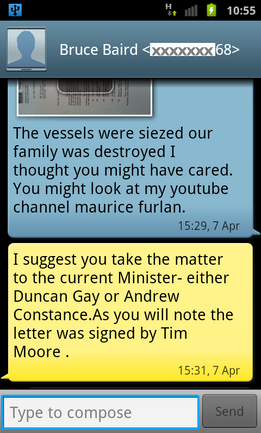 Mr Bruce Baird (pictured left) denies involvement in this matter (see sms below left) claiming his then chief of staff, Tim Moore handled the matter. He has directed me to take it up with current ministers and that led to the investigation. They now have a link to this site. I trust they will support my effort to have the matter resolved and made good before litigation. 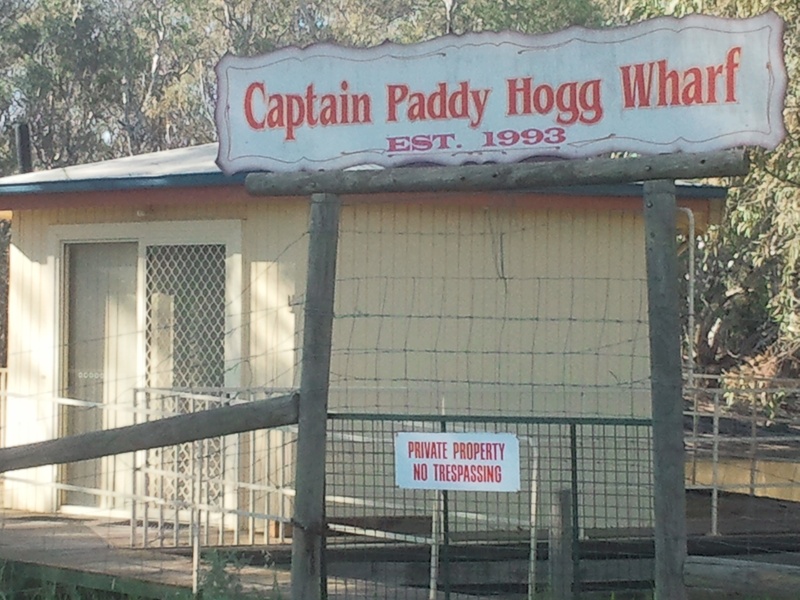 NSW Maritime authorities fought tooth and nail to prevent the construction of our houseboat. 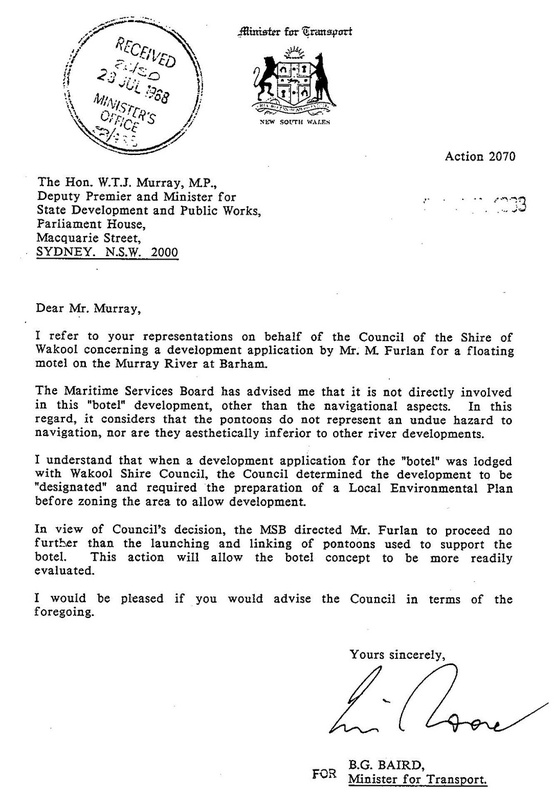 After 4 years of maladministration, they colluded with then Wakool Shire Council planning officers and cancelled our maritime mooring claiming non-payment of fees. Here is the undated 'Reminder - Overdue Account'. 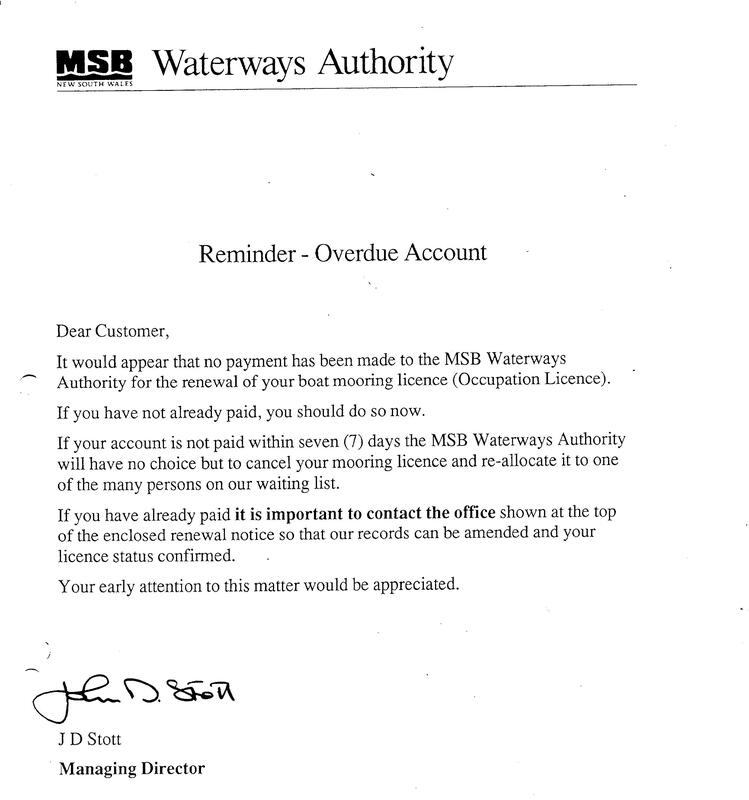 Here is account for Maritime Services Board mooring WS012 and confirmation that payment was made for the private vessels. 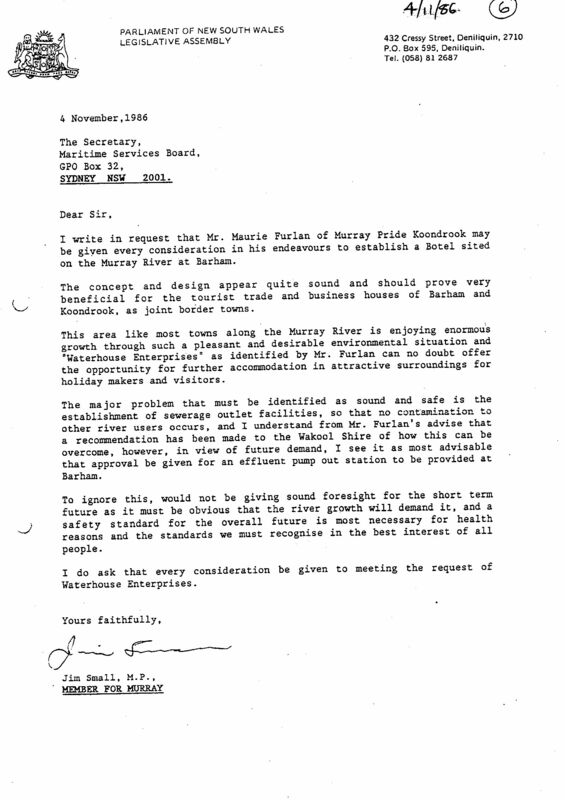 This letter from the Maritime Regional Manager in 1988 'REAFFIRMS' the vessels were not part of the Botel. Nevertheless he later served this NOTICE pursuant to sec 13U(2) of the Maritime Services Act. Google reveals that part of the Act relates to obstruction of the waterway. However, this picture shows that there was NO obstruction. Google also reveals the antiquated !935 law was used to have registered owners remove dilapidated and sunken vessels from port areas. However, this was not the case since the vessels were new and still under construction. Despite written advice to the contrary Maritime and council officials seized the vessels claiming that they were unauthorised Botel units. I was away in Melbourne at the time. 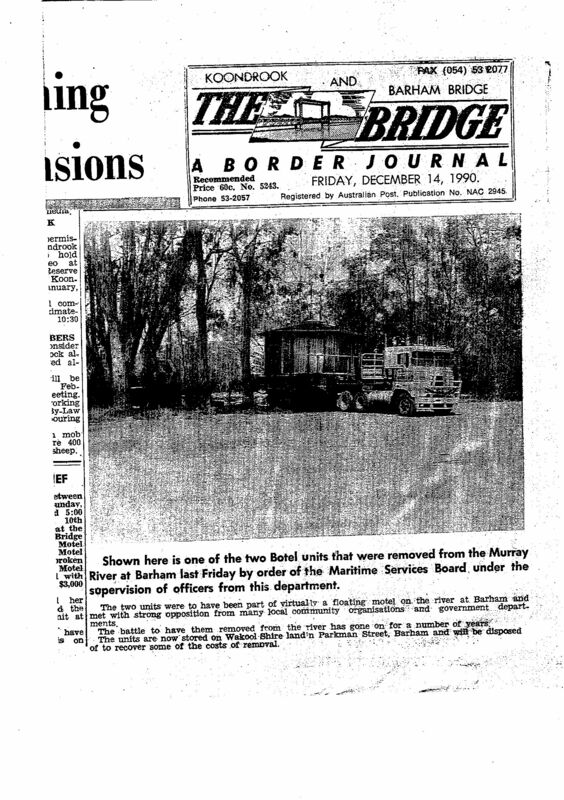 The Barham Bridge newspaper falsely reported the matter. The seizure was a criminal act for the following reason. Our Botel units were subject to Special Lease with Crown Lands. 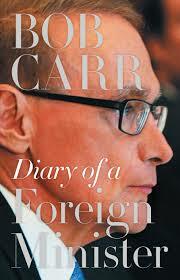 Bob Carr was NSW Planning Minister and he placed control in the hands of local government rather than State Maritime. 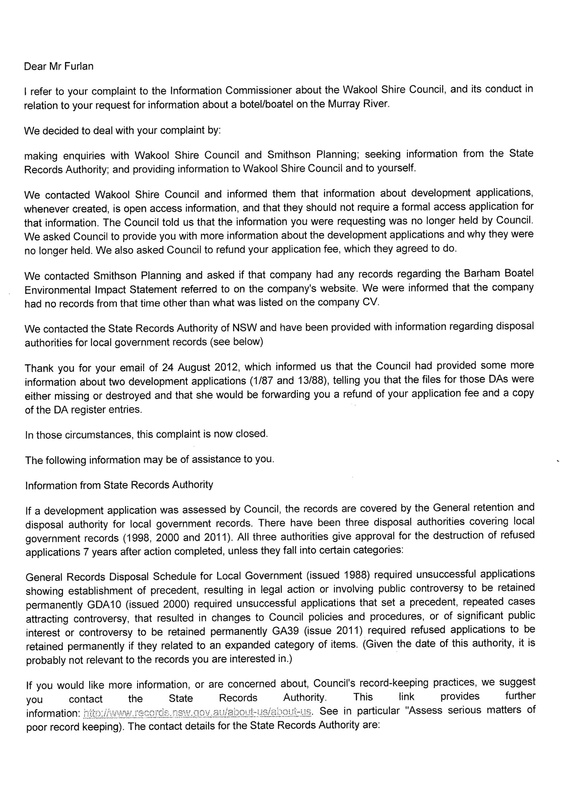 However this report describes the council being unable to cope with the formal Botel Application. The project had been before numerous government departments for 15 months at that stage. They were all incompetent to deal with it. They resorted to bullying, deceit and theft to cover their maladministration. There are lies in Hansard 3188,10 November 1988. The accounts about me and Waterhouse Enterprises by Messrs Small MP and Singleton MP contain little truth. Contrary to his account Jim SMALL MP originally supported our botel project. This letter from Bruce Baird to then Deputy Premier is also false and misleading. It confirms his role in the fraud. 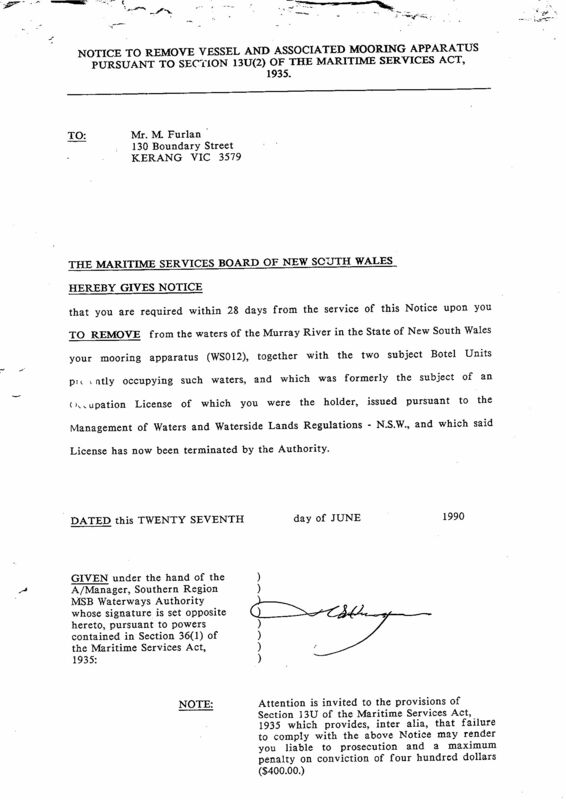 The Botel Application was made long before this type of development became 'designated' under the act. 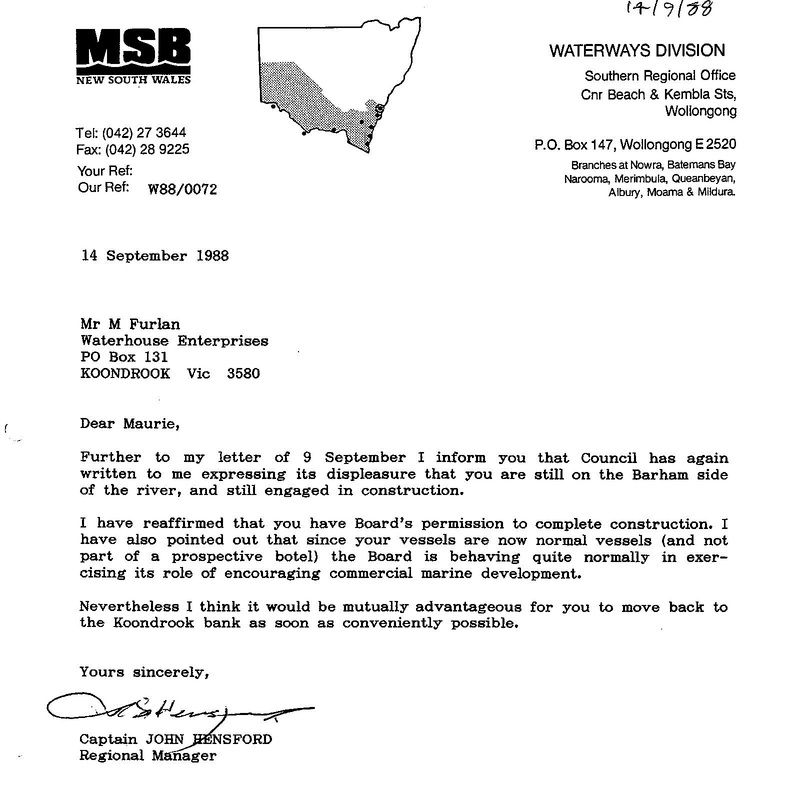 Both Victorian state and local government officials were part of the conspiracy. Not long ago, I found some information online which has opened up some very deep wounds. You too can find it on the Smithson Planning website. 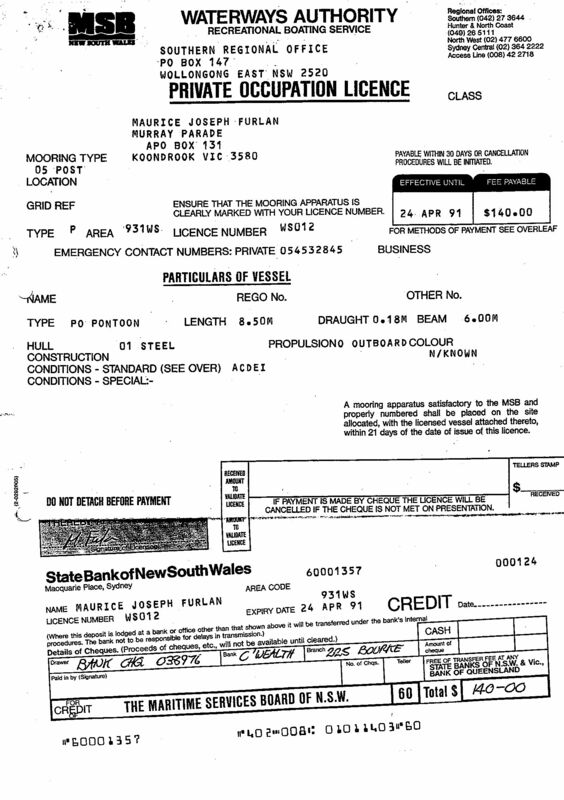 They make a fraudulent claim about a Boatel development on the Edward River, near Wakool, NSW. 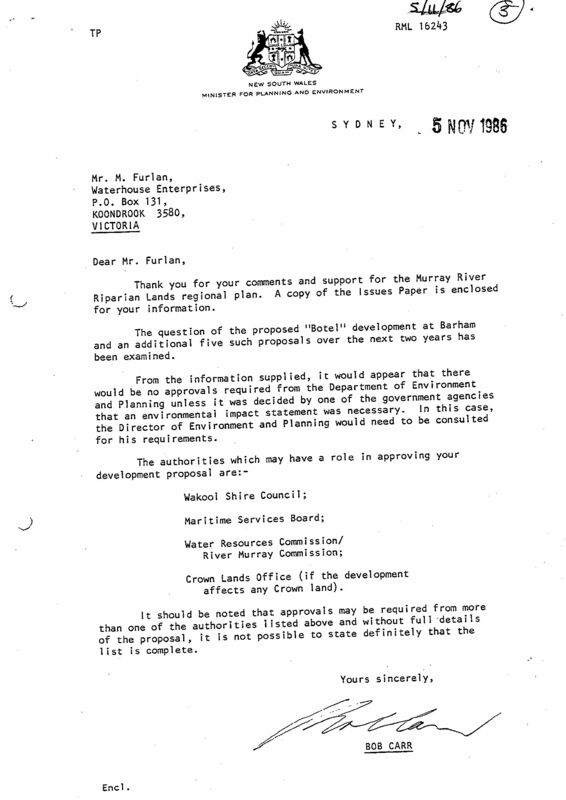 In fact, Wakool Council modified their Register of Development Applications to cover up the real Botel application on the Murray River at Barham, NSW. 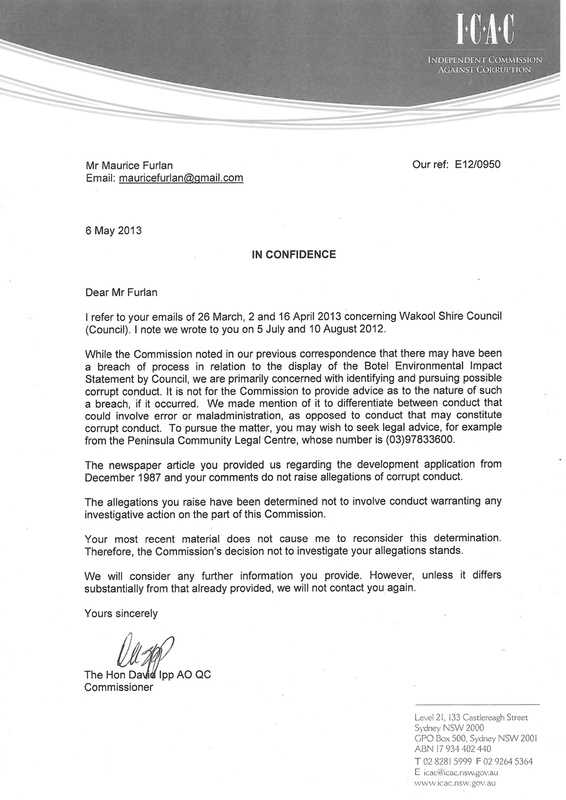 The current council deny the Smithson claim about them. Subsequently, more information has emerged. 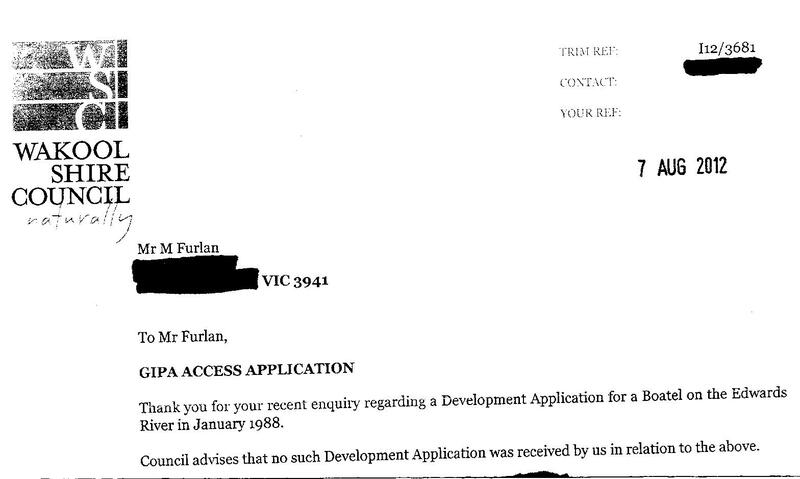 There is a fraudulent entry in Register of Development Applications. The second entry represents the cover-up the prior history. It has now been confirmed by the NSW Office of Information Commission that council destroyed the original files. The project became so controversial that maritime officials were forced to destroy the physical evidence of the vessels. There is little doubt that they were co-ordinated by the Planning Department headed by Bob Carr. The false Smithson claim also reveals to me a criminal relationship between the Swan Hill Promotion Group and Judges/Solicitors in the NSW Land and Environment Court Botel Appeal Case and my Child Custody Case in the Swan Hill Magistrates Court. That case led to the ultimate death of my former wife and business partner during our bitter Family Law proceedings. I can finally follow the dots all the way to Bruce Baird, Bob Carr (former NSW Premier and later Australian Foreign Minister) and previous departments in this matter. In 2012 I learned that the small boat went to Swan Hill where it was disguised as another commercial marine development in 1993. It became part of the Murray Downs Resort. More future reading. All documents shown on this site have been presented to anti-corruption commissions. Both NSW and Victorian anti-corruption commissions have since been provided many more documents supporting my allegations to them.